Home Ask SISTRIX Sitemaps Are there different kinds of sitemaps? Are there different kinds of sitemaps? Yes, there are up to six different kinds of sitemaps. HTML- and XML-sitemaps are the two sitemap-types that are seen most often. Please also see: How important is a sitemap for the indexing of my site? An HTML-sitemap is intended specifically for the user, as opposed to an XML-sitemap. It is supposed to be a graphical table-of-contents for the website, which will also help search engines crawl the entire website. The main features of HTML-sitemaps are logical groups of the website’s content as well as a clear map of the website with a reasonable hiearchy. Tip: Every webmaster can easily create an XML- and HTML-sitemap for their website. 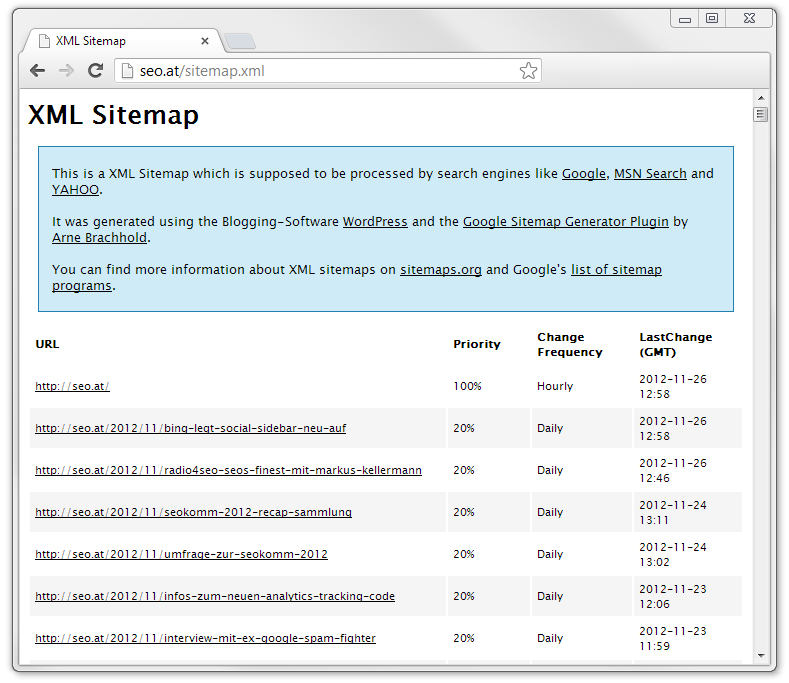 The online sitemap generator at XML-Sitemaps.com, for example, can help you. An XML-Sitemap, as opposed to an HTML-sitemap, is a structured index created specifically for search engines, in order to help them find either new, sparesely linked or deeply nested pages. A user will not have any added value by viewing the XML-sitemap, as, most of the time, the file (in this case XML) is only available in a machine readable, “unstyled” format. Though, you can use so-called stylesheets (CSS) to format XML-files any way you like. An image-sitemap is an XML-sitemap created specifically for images and their contents. Using an image-XML-sitemap, you can add specific information, such as the location (geo_location), to the images on your website and submit them to Google. Adding a separate image-sitemap can be helpful for your image rankings in the Google Image Search. Tip: The fee-based Sitemap Generator from XML-Sitemaps.com offers an addon which helps you create a dedicated image-sitemap in the XML format. A separate video-XML-sitemap allows you to enhance the video contents on your website with additional information, like defining a category to which the video belongs to. This helps videos rank better in the Google Video Search. Google also recommends adding the specific schema.org markup to your video content, so that so-called rich snippets may be shown for you pages in the organic search results. To quickly and easily add the schema.org Markup to your video content, we developed the Video Rich Snippet Generator for schema.org Markup. By using a separate news-XML-sitemap, you can complement your own news content – which you have optimized specifically for Google-News – with publication-specific information, like the release date. Adding a news-sitemap can positively influence your rankings within Google News. Tip: You can easily create and update a dedicated news-sitemap with the help of the pay-to-use Sitemap Generator by XML-Sitemaps.com. If a website delivers mobile content specifically for “feature-phones”, you should add a mobile XML-sitemap. This does not concern smartphones, as they have a full-fledged browser available. Feature-phones are phones that do not have a full-fledged browser and use WAP/WML, etc.